Informational interviewing is the secret weapon of successful job searchers! It is an invaluable tool for gathering information, making key connections as well as providing a more casual environment for interview practice. But keep in mind, these meetings are for practice and information gathering – not job interviews. Identify the field, department, position and individual that interests you. After evaluating your skills, interests and values through the assessment process and investigating KP career information through the links provided on this site, you will have several areas to investigate. By exploring more than one job title, you can make more informed choices and decisions with a broader perspective. Read all you can about the field, department, position or individual. Get a general understanding of what skills and training are required. Prepare a list of questions for your interviewer based on the information you would like to confirm or clarify. Make a list of people to contact for informational interviews. Use the KP intranet, organizational charts and friends or colleagues to help connect you to the right people. It's always easiest to start with the people you know and those who know your skills. If you don't have a name of a primary contact in a new area you are researching, send a short individual email to your current contacts asking them if they know someone who might know the person or information you are looking for. Arrange the interview, at their convenience. Introduce yourself and your current role/department. Specify that you are investigating potential career options for yourself and would like to gather information about their department, field or position. Ask for the information interview. Specify how long the interview might take (20-30 minutes is reasonable). Ask for an in-person meeting if possible, since face-to-face meetings tend to be more memorable. It's important to remember that you are asking people to take time out of their schedules to do a personal favor for you. Be courteous when asking for the interview and if you don't hear back from them immediately, don't take it personally. A polite follow up may be necessary to arrange the meeting and re-scheduled informational interviews are not uncommon. Dress appropriately, arrive on time and be professional. Bring your prepared questions but allow time and space for spontaneous discussion. Before you leave, ask for names of others who might be helpful in your research process. Ask permission to use your contact's name when asking for information interviews with the new contacts. Take time immediately after the information interview to write notes and reflect upon the information you've gathered. How are you feeling about the position, department or field after learning this new information? How does it compare to the other areas you have explored? Is this a realistic area for you to continue pursuing? What new information might you need? What roadblocks might be in your way? What other avenues warrant investigation? Always follow up immediately with a thank-you letter or email. Comment on the benefits of the meeting in your note. Record the information you gathered as well as your thoughts about how the information affects your interest in the department, field or position. You want the interview to be conversational rather than a battering of questions. Choose the questions that will illicit the most vital information. Add your own questions specific to the job or field you are investigating. On a typical day in this position/department, what do you do? What training or education is required for this type of work? What personal qualities or abilities are important to being successful in this job? What part of this job do you find most satisfying? Most challenging? What entry level jobs are best for learning as much as possible? What are the salary ranges for various levels in this field? How do you see jobs in this field changing in the future? Is there a demand within KP for people in this occupation? What special advice would you give a person entering this field? What type of training is required or suggested for people entering this field? What are the basic prerequisites for jobs in this field? Which professional journals and organizations would help me learn more about this field? How do you define success in your department? What do you think of the experience you've had so far in terms of entering this field? From your perspective, what are the challenges you see working in this field? If you could do things all over again, would you choose the same path for yourself? Why? What would you change? What do you think of my resume? Do you see any problem areas? How would you suggest I change it? Who do you know that I should talk to next? When I call him/her, may I use your name? Kaiser Permanente is an organization built upon networks and relationships. The more people you know in a variety of departments, the more you will understand and connect with this large, diverse organization. After conducting a number of informational interviews, you will feel more informed and may even feel ready to make a decision about pursuing training for a specific field. Or you may decide that you are not interested in moving forward in this area and would prefer to investigate other jobs. 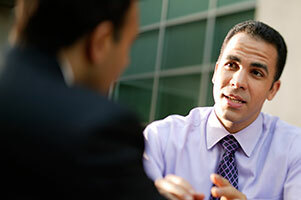 Either way, informational interviewing helps you make the most informed decisions about navigating your career through Kaiser Permanente, as well as make useful lifetime connections throughout the organization.